TP-LINK does not operate on the bleeding edge. While others rush buggy AC2350 and AC3200 products to market, the company has yet to release its first AC1900 class router. Its latest router is the Archer C8 I'm reviewing today. 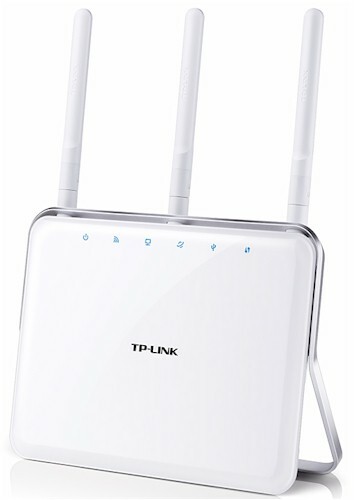 The C8 is TP-LINK's second run at producing an AC1750 router (or third if you count the Archer C7 V2). TP-LINK has classed-up the C8's packaging for higher WAF, opting for an all-white motif, save for the matte silver bracket that stands the router upright with a slight backward tilt. You can't remove this bracket—not easily at least—so wall or ceiling mounting is out. The front panel callout diagram below explains all the backlit blue indicators that lie below a glossy clear front cover. A row of cooling exhaust slots are discreetly located at the top of the router, which has a gap between it and the bracket. The rear panel has only Gigabit Ethernet (with no Link / Activity lights) and USB 2.0 ports, Reset / WPS button and power switch. The USB 3.0 port is on the right side panel aside a wireless on / off switch. Most of the back cover is perforated for cooling. The C8 has a completely different design than the Archer C7. It's a fairly standard second generation Broadcom design based around a BCM4709 BCM4708 CPU. The board shot taken from the FCC ID docs shows three RP-SMA connectors for three external dual-band dipole antennas—no 2.4 GHz antennas squirreled away inside this time. A single large heatsink spans across two RF "cans" and is coupled via thermal pads to the can lids that are in turn coupled to the CPU and two wireless devices via more thermal pads. There are detail shots of this in the gallery later on. The board closeup with heatsink and can tops removed is too fuzzy for component ID, but clear enough so that you can see the key component layout. The overall design reminds me a lot of the ASUS RT-AC68U, albeit a bit more compact. The C8 key components are summarized in Table 1 along with the C7 V2's. I am waiting to hear back from TP-LINK on the RAM and flash so they are guesses for now.